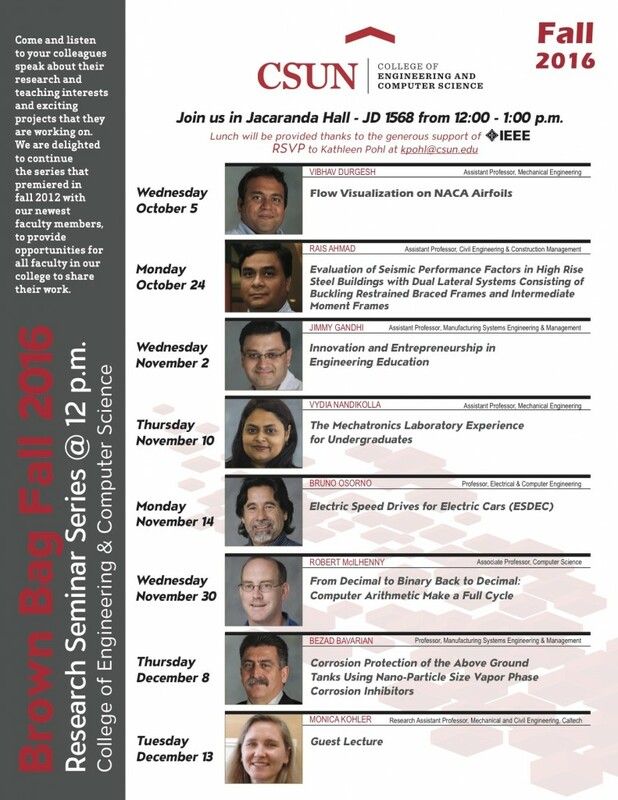 California State University, Northridge’s College of Engineering and Computer Science is hosting its ninth biannual Brown Bag series this fall, bringing together faculty from different disciplines across the college to share their work. The series began in the fall of 2012 and is held every semester. Open to the campus and the community, it provides an opportunity to learn more about the research projects conducted by faculty in the college. Some of the topics to be covered this semester include: The Evaluation of Seismic Performance Factors in High Rise Steel Buildings; the Mechatronics Laboratory Experience for Undergraduates; and the Corrosion Protection of the Above Ground Tanks Using Nano-Particle Size Vapor Phase Corrosion Inhibitors. Last year, the series caught the eye of the San Fernando Valley section of the Institute of Electrical and Electronic Engineers, the largest professional technical society in the world with over 400,000 members worldwide. The IEEE provides lunch for those who attend the seminars. Ramesh said the series has led to collaborative research projects across the college. Electrical engineering professor Ruting Jia and mechanical engineering professor Vidya Nandikolla worked with a group of undergraduate students on a research project sponsored by Northrop Grumman. Professor Jimmy Ghandi, who teaches in the manufacturing systems engineering and management department, is leading the way, with a large grant that connects high school students to careers in the field. He is working collaboratively with faculty members from the college, as well as the Michael D. Eisner College of Education and the Mike Curb College of Arts, Media, and Communication. Nandikolla presented in the fall of 2014 on Active Footwear Designs for Diabetic Mellitus and will present this fall on The Mechatronics Laboratory Experience for Undergraduates. She said the series is often the only opportunity to identify the work of other colleagues. Professor Maryam Tabibzadeh, who teaches in the department of manufacturing systems engineering and management, gave a seminar in the fall of 2015. Her presentation, The Role of Human and Organizational Factors in the Safety and Reliability of Complex Technological Systems, gave her an opportunity to share her research into the human organizational errors that contributed to the 2010 BP Deepwater Horizon oil spill. She said the series provides a unique opportunity for faculty in the college with similar and different backgrounds to connect. The next seminar is scheduled for Oct. 24 at noon. To RSVP for the event, contact Kathleen Pohl at kpohl@csun.edu.